Pinball machines and video games (oh, and the movie Aliens) popularized the phrase "Game Over." Those two words are also used at times of political unrest. Google Images turns up plenty of examples. And here's a new one, via Facebook, photographed on July 2 during a laser light show on the side of a government building in Cairo in Tahrir Square. Following days of massive, violent country-wide protests against Mohamed Morsi—the first freely, democratically elected president in the country's history—the Egyptian military stepped in and removed Morsi from power. This is a striking image from the stunning events of the last several days and one we thought would resonate with those of you who play games. 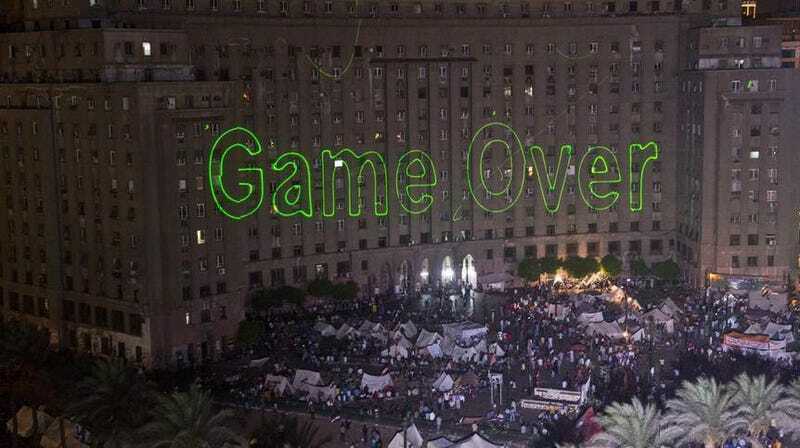 Protestors used the same phrase in 2011 when protests led to the elections that ushered Morsi into power. Last month, a Turkish reader told us about the more direct influence of Grand Theft Auto in helping to inspire his country's protest movement.